Bangalore based ambient/post tock band Until We Last just come out with their debut EP, Earthgazing. We spoke to guitarist and master mind Ketan Bahirat about the band's latest release, and future plans. 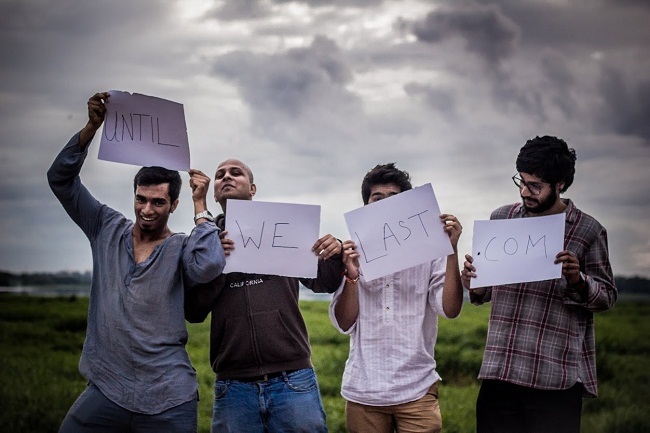 Bangalore’s ambient/post rock band Until We Last released their debut EP, Earthgazing, this week; marking the band’s first checkpoint, spear heading the Indian post rock movement. The six track EP in its simplest form seems like a look through Until We Last’s eyes, for a day; opening the album with a sweet toothed guitar melody – painted in this writer’s wishful imagination as the rising of the morning sun – the album dutifully pans through the ‘gaze’ of an innocent mind, ending the record with chiming bells sprinkled across a night sky. Guitarist and founder, Ketan Bahirat, is not one to fool around trying to spin too many words together in an attempt to realize his musical thought process. Ask him what Earthgazing is about, and he replies: “It’s is like a moment of looking at the earth, understanding and taking in how beautiful it looks,” with alarming ease. Delving deeper into a conversation with the guitarist gives one a clearer picture of the band’s inherent drone like simplicity, which reflects in their music – universally christened, post rock. “I mean the only word that can sort of define it [Until We Last’s music] is post rock,” a slightly bemused Ketan announces. “I mean that’s a generic term; but we haven’t come up with our own words or anything.” Ketan counts names like American post rockers This Will Destroy You, and Explosions In The Sky, as influences on the band’s sense for music; with elements of rock, punk, and even metal, that the members have grown up listening to, bleeding into the record.